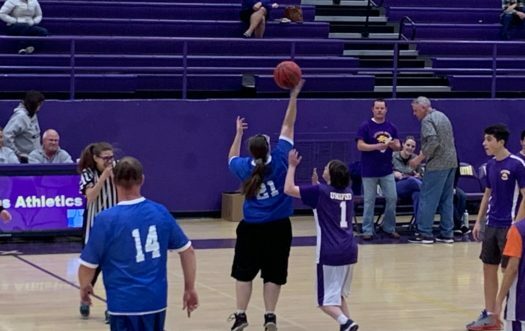 The Littleton Lions Unified Basketball team lost to the South Suburban Stars Monday night 56 to 54 in an exciting and quick paced game. This was a great start to their season with a great effort made by the entire team. The team was led by senior Scott Bourg with 12 points and 7 rebounds and freshman Ian Jorgensen, scoring a total of 10 points in his debut game. The Lions stayed close behind the Stars for the entire game. The Lions were able to recover from multiple 10 point deficits throughout the game including one in the last quarter, where Bourg almost tied it up in the last few seconds. Though the Lions weren’t able to win the game, they still played with amazing passion and determination. Their sportsmanship skills were also unprecedented as was seen when a player for the Stars got injured and many of the Lions went over to make sure he was okay.